On Wednesday, November 8, 1961, Rev. Martin Luther King, Jr. spoke for an hour in Old Main — now Lincoln Hall — at Portland State College to an enthusiastic and receptive crowd. King’s trip to Portland was sponsored by the Urban League, and he spoke at Portland State as part of the College’s commemoration of the centennial of the Civil War. Vanguard story and Viking yearbook photo, via PSU Library University Archives. “We have come a long way toward making integration a reality, but we still have a long way to go. 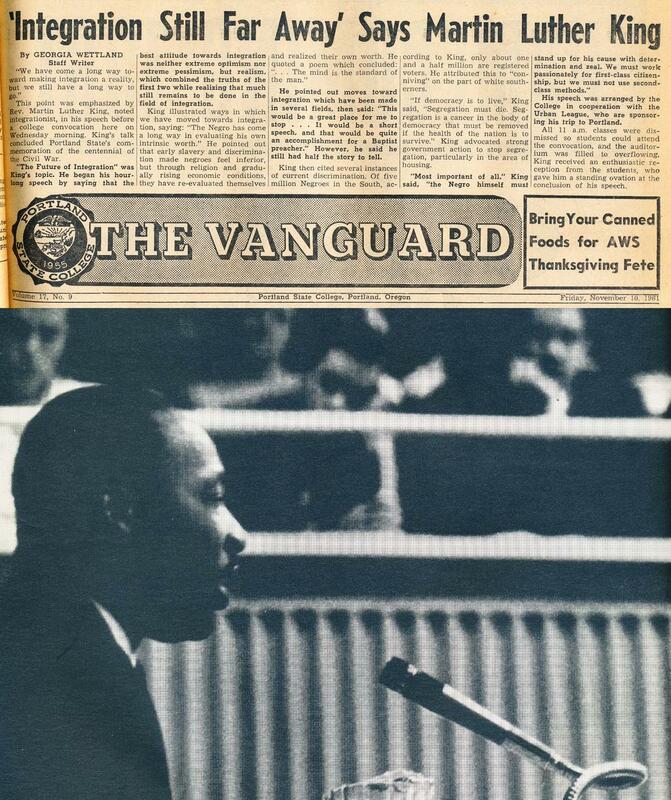 Staff in PSU Library Special Collections and University Archives scanned and shared the Vanguard story as well as a photo of Dr. King from the Viking yearbook. This week, Portland State University pays tribute to Dr. King in a series of events. Dr. Angela Davis, a world-renowned author, educator, and activist, delivers a keynote address tonight. Her many books are available to PSU students, faculty, and staff through PSU and Summit Libraries. You can also find many of Dr. King’s writings on the Library shelves.